Tucked deep in the Emerald Green Valley in southern Minnesota, Days Inn Mankato hotel is near Rasmussen Woods Park and conveniently located at the intersection of Highways 169 and 14. Our Mankato hotel is within easy reach of popularlocal attractions and outdoor activities.Our pet-friendly Mankato hotel offers all the amenities to make your stay hassle-free. Start your day with free continental breakfast, then take advantage of free Wi-Fi Internet access or take a dip in our heated indoor pool or hot tub. Keep clothes fresh with our guest laundry facilities or host an event in our meeting space. 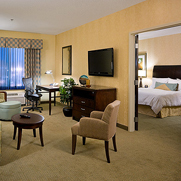 Handicapped-accessible rooms and Jacuzzi suites are available.